It’s hardly difficult to imagine a time before Google Maps. A trip to the supermarket meant being able to know which busy times to avoid. A trip from Manchester to Blackpool meant The AA Book of the Road as well as The A-Z (unless you caught the X60 bus from Chorlton Street). Over the last month, Google has added some splendid features to its online mapping tool. Among the things you could do on Google Maps includes the following activities seen below. Google’s Street View has been extended to a select number of parks and gardens. A trip to Legoland in Denmark, and any of the Royal Parks in London is possible. Heaton Park, on the outskirts of Manchester, is navigable in Street View, though this is not the case with Platt Fields and Fog Lane parks, nor Boggart Hole Clough. If you’re the proud owner of an Android based device, Driving Mode lets Google find your way from A to B, like a SatNav device. Driving Mode displays your journey in a three dimensional view, with an arrow pointing the way to your destination. For selected retailers, pubs and restaurants, you can avoid busy times of the day by clicking on a shop, café or public house. In Google Maps, a bar chart tells you how busy it is over a week. Based on historical footfall figures, it’s gratifying to see you’re not the only one who thinks TESCO is busy on Sunday afternoons. You can save your usual route onto an Android mobile device for future reference. This is useful if you wish to refrain from wasting your precious mobile data allowance. Furthermore, this is less of a resources hog on your device. For a while, Google Maps was slightly behind its main mapping rivals in terms of 3D views. Microsoft’s Bing Maps got in before Google with its Birds Eye View option. Google’s three dimensional views was hitherto the preserve of Google Earth, a separate program. On today’s PCs and mobile devices, Google Earth’s 3D views have been a feature of Google Maps for the best part of two years. For major town and city centres, a more detailed 3D view is available with accurate terrain mapping. The detail is striking in comparison with the standard 3D views (as seen below). Spot The Difference: notice the different levels of detail seen within one part of Farnworth compared with another, and nearby Moses Gate. Oh, and the club (just off camera) which is noted as ‘St Gregory’s Social Club’ was The Phoenix Club in Peter Kay’s Phoenix Nights. Shabba! Seen in an isometric view – more akin to Bing’s Bird’s Eye View mode, is our next door neighbour. One with 25 million or so visitors a year. 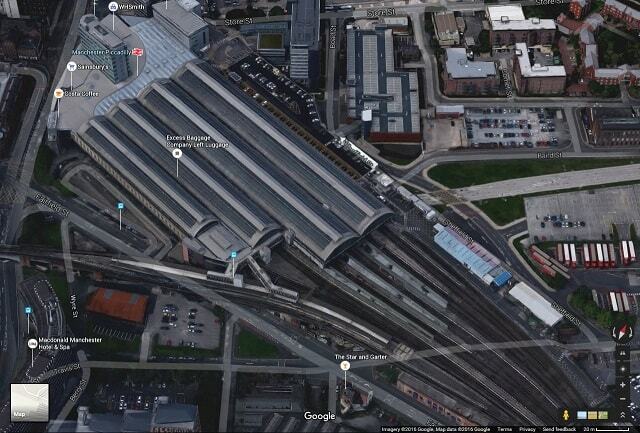 A Google Maps tilt view of Manchester Piccadilly railway station. Which, if you believe the automatic announcers, has wet weather 365 days in a year. Which is why “surfaces may be slippery”. We cannot quite “see our house from here”. Net66 HQ is on the right, off camera. How does Bing Maps compare with Google Maps? As has been the case for the last two years, Bing Maps seems to have come up in leaps and bounds. With each of its features also available in Google Maps, the changes could be seen as mere ‘window dressing’, to fit in with its Windows 10 look. Strictly speaking, Bing Maps is neater and easier on the eye. 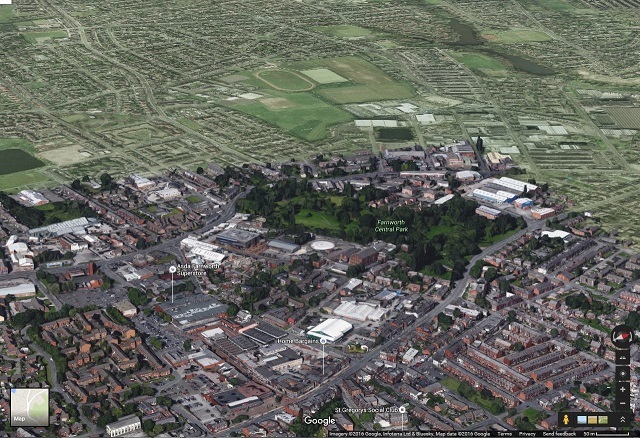 Where Bing Maps has the edge on Google Maps is its Ordnance Survey map views. With the author of this piece a lifelong cartographile, it is a boom for hikers who wish to plan a walk or backpacking holiday. That saves on the £7.99 price for a bog standard Landranger map (the sheet for Net66’s area is 109 if you’re interested). Microsoft’s incorporation of OS maps is a legacy of their ownership of Multimap.com, whom in the noughties enabled you to view Ordnance Survey maps in a small window. Google Maps’ greatest strength, as well as its Street View and three dimensional views, is its dissemination of public transport results. Though Bing Maps displays bus and rail times, you have less flexibility in viewing alternatives compared with Google. Google Maps still has the edge over competitors like Bing Maps. Firstly, it is Google’s instant brand recognition and the popularity of Android devices for cost-conscious technophiles, which explains its popularity. Bing Maps has the looks and one thing you certainly can’t whack is its support for the Ordnance Survey’s Landranger and Explorer map views. Perhaps, with the recent negative publicity that Alphabet, and its illustrious subsidiary has had in the last week, Bing might win a few converts. Oh, and we love tilt mode. It’s a shame it couldn’t boost my score on Pinball Fantasies.